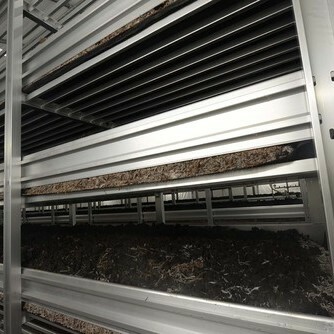 Back when Phase 1 mushroom compost was filled, shelving was made from aluminium because of the corrosive nature of the compost. 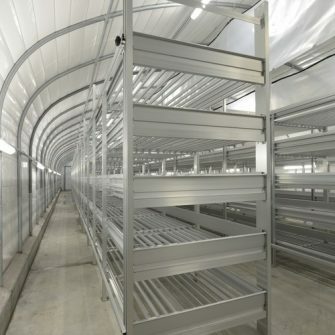 With the introduction of Phase 2 & 3 composts galvanised shelving became popular because of the lower cost. 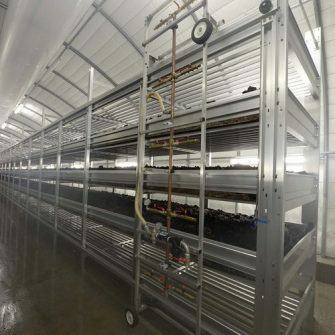 The corrosion resistance of some galvanised shelves was poor with the life expectancy around 10 – 15 years.Quality galvanised mushroom shelving had become expensive so we decided to design a high quality aluminium mushroom shelving system. Aluminium mushroom shelving is normally supplied mill finished. We have gone one step further and anodized the exposed parts: Sideboards, end boards and legs. Although it increases corrosion resistance, Anodizing is not necessary for corrosion resistance of the shelves and is generally done for cosmetic appearance only. We have a number of different shelving specifications available for you to choose from. We have a choice of Round Top or Flat Top. The standard height is 180 mm with deeper boards available on special order. The sideboards are anodized. The legs are 80 X 50 mm – 3 and 5 mm wall. This width is sufﬁcient for sideboards to be joined on legs giving extra strength and easy assembly of the shelves. The legs are anodized. The end-boards are made from a bespoke aluminium proﬁle and are anodized. 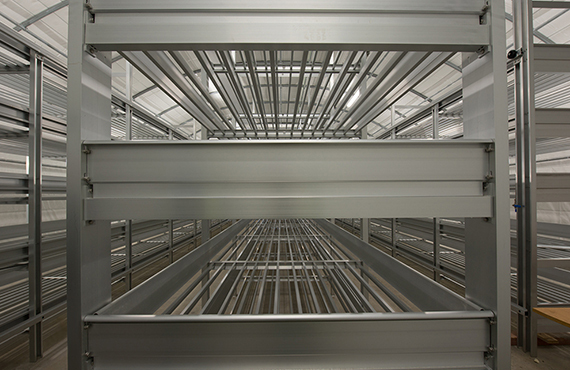 Our crossbeams are designed to give greater strength than standard within the industry. End crossbeams are closed on exposed face. Crossbeams can be punched for fitting of underbed mushroom watering system. Base rails are 35 x 20 mm 7–10 mm deeper than standard. Joiners are aluminium profile and pop riveted into place. Top and bottom Lorrie rails are available. Top rails are available in Standard or Heavy duty profiles. We can supply extra support brackets at 750 mm centers if heavy, electrically-operated picking lorries are being used. You can use the details below to get in touch. Alternatively, please fill out the quick form and we will be in touch with lightning speed. NB We specialise in supply from factory-warehouse to grower. Minimum order is per shrink wrapped pallet of approximately 800kg or per 6mt or 12mt container approximately 26 ton.